Verita LaBelle DeVries passed into eternity and into the loving arms of Jesus on February 23, 2018 after 96 fruitful years of loving and helping here on earth. She was born in Eldorado, Kansas to Lewis and Hester (Hand) Barnum on October 5, 1921, the fourth of 12 children. Her spiritual gifts were helping and encouraging others, and she was good at it. She liked to smile, have fun and really loved children. Her hobbies were sewing, quilting, knitting, crocheting and baking. She and her husband Francis “Gus” loved the grandkids and spending time with them. 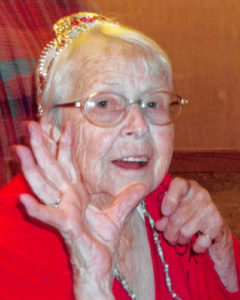 She is preceded in death by her husband Francis “Gus” DeVries, 10 siblings, two grandchildren and her mother and father. Surviving are her daughters Beverly & (Jerry) Schaap and Patricia & (Mike) Smith; 4 grandchildren Sue Norton, Dave & (Cyndi) Schaap, Eric & (Melissa) Smith and Andy Smith; 10 great-grandchildren; 7 great-great-grandchildren and her sister Gloria & (Luther) Shears. Heaven has gained a special and wonderful addition to their family, but earth and her daughters will sadly miss her smile and loving arms. Dementia finally won the battle here on earth, but God has given her a new body as He promised, and a much better life. Visitation was held 6 to 8 p.m. Monday, February 26, 2018 . Funeral Services were held at 11 a.m. Tuesday, February 27, 2018 at the Marshall Funeral Home, Greenville with members of the family meeting with friends and relatives from 10 a.m. till the service. Memorial contributions may be made in Verita’s name to Faith Hospice or Alzheimer’s. Burial will be in Altona Cemetery. Arrangements are by Marshall Funeral Home, Greenville, with complete obituary online at www.marshallfuneralhomeinc.com where you can leave a message of condolence for the family.